Verizon Inks $4.4 Billion Agreement To Buy AOL : The Two-Way Verizon said the acquisition will help build its digital and video platforms. Verizon had previously announced plans to launch a video service that focused on mobile devices. 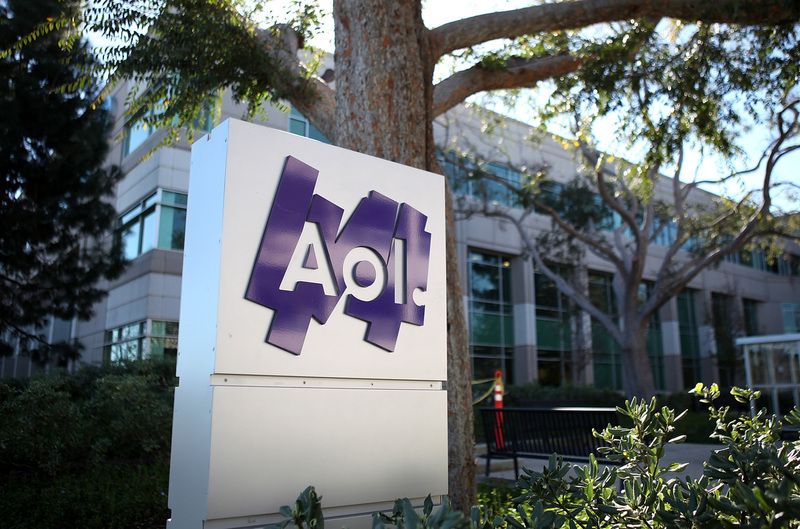 The AOL logo is posted on a sign in front of the AOL Inc. offices in Palo Alto, California. Verizon Communications has agreed to pay $4.4 billion to buy AOL Inc. In a press release, Verizon said the all-cash acquisition will help build its digital and video platforms. "Verizon has said it plans to launch a video service focused on mobile devices this summer. The company has offered few details, but last month Chief Financial Officer Fran Shammo said the service will offer a mix of paid, free and ad-supported content and won't try to replicate traditional TV. "The service will feature shorter snippets rather than 30 or 60 minute shows. It also could include multicast programming—a sort of broadcast service that uses cellular airwaves—for delivering live content like sports and concerts, along with on-demand viewing." "Verizon's vision is to provide customers with a premium digital experience based on a global multiscreen network platform," Lowell McAdam, Verizon chairman and CEO, said in a statement. "This acquisition supports our strategy to provide a cross-screen connection for consumers, creators and advertisers to deliver that premium customer experience." Pending regulatory approvals, the companies said they expect to close the deal this summer. Update at 7:58 a.m. ET. What Is AOL Today? Many people probably still associate AOL as one of their first Internet service providers. But more than two decades later, AOL is more of a media company: It owns The Huffington Post, TechCrunch, MapQuest and Moviefone. According to the company, it is the fourth largest online property in the U.S. with 200 million monthly visitors to its sites.